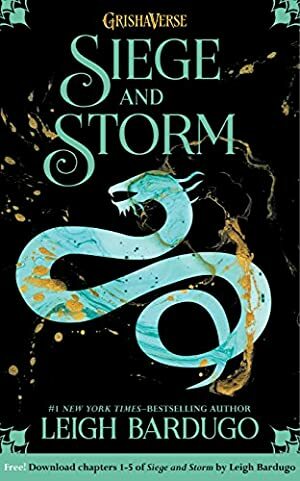 Download the first five chapters of the widely anticipated SIEGE & STORM, book two in The Grisha Trilogy! The Darkling has emerged from the Shadow Fold with a terrifying power and a dangerous plan that will test the very boundaries of the natural world. With the help of a notorious privateer, Alina returns to the country she abandoned, determined to fight the forces gathering against Ravka. But as her power grows, Alina slips deeper into the Darkling's game of dark magic and control-and farther away from Mal. Now, she will have to choose between her country, her power, and her heart, or risk losing everything to the oncoming storm. We started tracking this book on March 28, 2013. The current price of this book is FREE last checked 3 months ago. We last verified the price of this book about 3 months ago. At that time, the price was $0.00. This price is subject to change. The price displayed on the Amazon.ca website at the time of purchase is the price you will pay for this book. Please confirm the price before making any purchases.